Fans of Vincent Сassel and Tina Kunakey congratulate them on the engagement. The model reported on joyful event on her Instagram, having published a joint photo with the lover. And although some Internet users are still convinced that the 21-year-old model is just a temporary hobby for the 51-year-old actor, general media report: lovers will really be married in August. According to foreign publications, Tina has already chosen a wedding dress from the designer Viktor & Rolf, and the wedding itself will be held in the French Biarritz. Vincent and Tina, on their own example, once again proved that all ages is under the influence of love. Recall, Vincent and Tina met in Ibiza during the holidays. In a conversation with reporters, the model admitted that she did not even know about her lover's creative profession. According to the girl, she grew up on a farm and in her childhood she never watched TV. There were rumors that the pair split. However, contrary to the conversations, they're doing just fine. 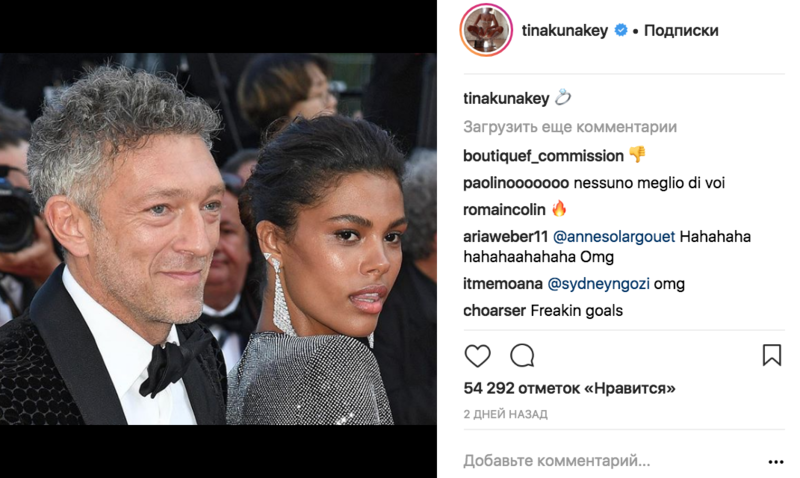 They were so many times on the verge of breakup that the journalists were sure, that Vincent Cassel and Tina Kunakey will not get married. Moreover, the 30-year age difference, according to inexorable statistics, does not strengthen such relations at all. However, the star couple marries in August, the former husband of Monica Bellucci has already officially proposed to his lover. And if someone suddenly assumed that Vincent had gotten into his arms a naive, young beauty, then he don't have to worry. Despite her young age, everyone who knows Tina, notes that she is wise and very practical. Tina is adventurer and has the desire for victory. At the age of 15 she was engaged in swimming, at the age of 16 - she had mastered French, Spanish and English fluently, she lived separately from her parents in another country and earned money thanks to photo sessions and fashionable defile. On attempts of relatives to dissuade the freedom-loving girl from "dangerous" life, Tina reacted categorically and refused to return home. By 18 the girl received a solid portfolio: participation in PR campaigns of the brands Roxy, Billabong and Quicksilver, starrув in Matt Pokora's music video, thanks to which she attracted attention by the world model agencies. Not surprising, Vincent Cassel couldn't resist. The couple began dating from the summer of 2015. Tina and Vincenta were noticed by tourists on Ibiza, but the journalists did not attach importance to the relationship, considering it an affair. The first official appearance of their couple in public took place in November 2016 at the Victoria's Secret party, after that, according to insiders, it became known that Tina and Vincent are together for a year and a half.